YOU DON'T KNOW WHERE TO DOWNLOAD YOUR DOWNLOADS ? Login to your Account HERE or Click My Account in the upper right. Once you see page below....Click VIEW button on the right. Then you will now see your Downloads. Select the download you want and enjoy. 1.Go to your favorite product page (the product you would like to review). 2.Click on the "write a review" link (you can find it on the left column) OR go directly on the bottom of the page. 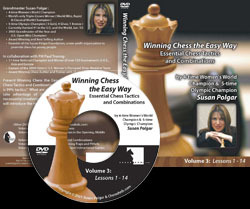 3.If you are not yet logged in with your chessvideo account, you will be prompted to make a "quick login", before being able to write your review. 5.I recently purchased the "Foxy Openings" DVD 78. Nimzo-Indian Part 1 & 2 (IM Andrew Martin). I am disappointed that, while it teaches an opening for Black, it is visually presented from the White side point of view! It would be much more effective (easier to learn/remember) if the screen showed the Black pieces on the bottom. My question is: Is there a way to change the orientation of the screen to show the games from Black's point of view (bottom to top)?? All files are guaranteed for life. After a few google searches I found the Windows Media player sometimes has problems due to needed Codecs. I then found a media player which does not need said Codecs and it solved the problem. Videos are playing fine using this program.